Every maintenance person needs one! "Selected by the OSHA Electrical Technical Equipment Committee as the only instrument of its type for use by OSHA compliance officers to identify and cite electrical hazards of 50 volts or more." 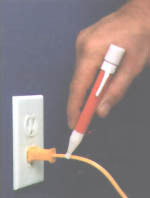 Probe tip glows bright red in the presence of AC voltage. Available in three post terminal sizes: 10-24 Thd., 10-32 Thd., 1/4-20 Thd. Highly-compacted coil maximizes heat transfer. Specifically designed to meet the demanding requirements of runnerless applications. PART NO. I.D. LENGTH VOLTS WATTS TYPE "J"
900°F Hi-temp terminal rings with non-insulated butted seam barrel. Packaging: 50 pieces per package. We carry a full-line of Thermocouple/RTD accessories, leadwire, and terminations. Miniature jack panels and Type K also available. * Also available with all nickel conductor with stainless steel overbraid.